College admissions decisions are mostly in, and with every envelope high-school seniors have a better idea of where they're going to be continuing their academic careers. But if a student is academically burned out, or doesn't yet have the college readiness skills that will allow them to thrive independently, a Gap Year might be a great option. This article, by Everything Summer Gap Expert Deborah Lesser Friedman, provides great advice on who a Gap Year might be right for, and what kinds of experiences are beneficial for certain students. Even after you’ve identified camp or program options that can provide the right environment, and secured a space for your student, there are important steps you can take to prepare both the child/teen and chosen program for the summer ahead. Summer is an opportunity for a student to author a unique chapter in their story as an individual and applicant. But if this story is going to be compelling enough to matter to a college admissions team, then it will need to matter to the student first and foremost. 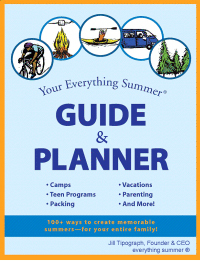 Read more to understand the importance of involving your teen in the summer-planning process, and steps you can take to empower them to take charge. Kids today are undergoing a subtle, generational identity crisis steeped in specialization - and traditional summer camps provide a valuable opportunity to rediscover childhood. See the Everything Summer Pre-College Roadmap! Each summer camp has its own unique culture that distinguishes it. This culture is generally encompassed by the owner or director, and oftentimes permeates throughout the camp, impacting the staff, campers, and general feel of the whole camp environment. That said – even within a camp that shares a strong culture, each age-group, and each bunk, is going to have its own distinct mix of kids and thus own its own personality. When we’re working with a camp family, we always have conversations with camp directors to discuss these social factors. Speaking candidly with a camp’s director will give you great insight into fit, and will provide clarity regarding what bunk and session placement will be most beneficial to your child. Whether you’re picking a new camp for your child or children to attend, or your child is going to be returning for another summer, here are factors to keep in mind to help set your camper up for success. The Gap Year, a concept that has been commonplace in countries such as England and Australia for some time, is becoming increasingly popular with American students. College advisors, teachers and even universities, such as Harvard and Princeton, are discussing the benefits of a gap year and encouraging students not go to college right away. The late fall and early winter frequently mark the time of year that camps begin holding organized reunions or get-togethers for current campers. Among the lifelong benefits of attending overnight camps or teen programs are the incredible friendships that children and teens are able to make. And while these friendships are oftentimes a staple of a successful summer, that doesn’t mean they need to be limited to the summer season – and placing a priority on these outside of summer will ultimately serve your children or teens well in the long run. As classes pick up and students buckle down, it can be easy to get lost in the rigors of advanced coursework, team sports, and other commitments – and in the fall, it makes sense that summer feels very far away. However, a student who thinks ahead can position themselves well to accumulate impressive and meaningful extracurricular credentials, while a shortsighted start to the school year can leave a student at a disadvantage when they finally turn their attention towards springtime or summer plans. Sometimes summer just isn’t what the camper, or their parents, hoped for. And this can lead to a difficult question for parents to confront – what’s next? With re-enrollment around the corner, now is the time to establish whether a situation is correctable or it’s time for a change. So what are the possible options to tackle a summer that didn’t work out as desired?